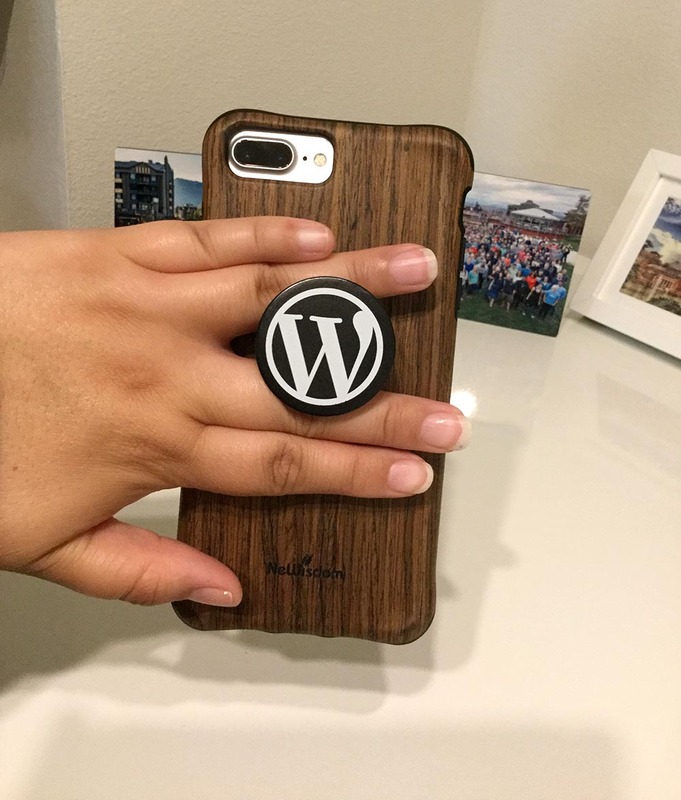 I happen to wear a ton of WordPress swag, not only are they super comfortable- but useful as well! I always get asked about where I get these items from, so I figured it was time to write a blog post about it. Here are some of my personal favorite items that I can’t stop using. My FAVORITE item that probably gets the most use, is my WordPress hoodie. It’s black, super soft and the W logo is perfectly placed. I probably wear this hoodie 5 days a week, minimum. My second favorite clothing item is the gray WordPress t-shirt with the logo in white. I have 2 because yes, I somehow manage to wear them twice a week. The material is so soft and it just goes perfectly with a pair of jeans. The swag store has a ton of great t-shirts. All of them are great, but the reason this WordPress t-shirt is my favorite is due to the uber soft material. 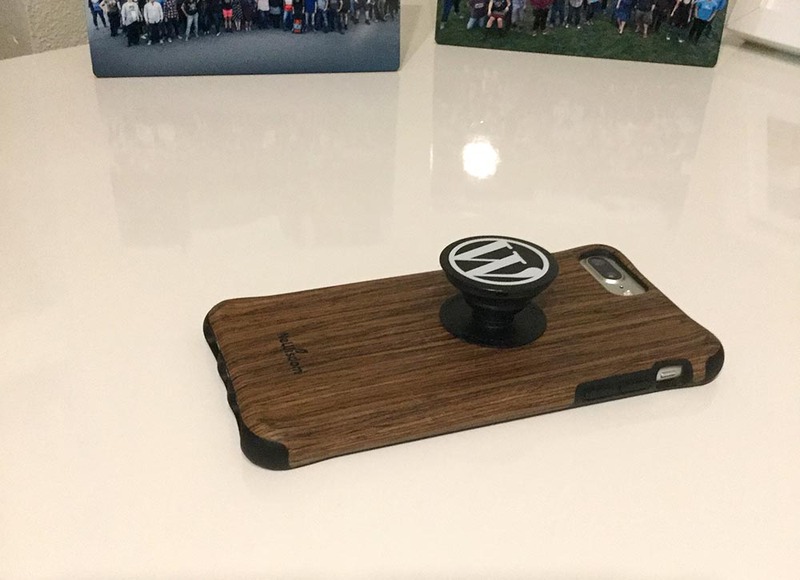 The accessory I use the most is the WordPress PopSocket. I use it on my iPhone 7+ and I get SO MANY compliments on it. It makes it so easy to grab and hold your phone, it’s also a great stand. You just add it to the back of your phone or phone case. I have two pairs (because I always lose a pair). I wear mine constantly. They’re perfect, they don’t scratch easily. Also, my friends try to steal them since their frame looks great with all face shapes. They’re awesome. I highly recommend them. The pictures don’t do this tote bag justice. Not only is the material a super-strong canvas, the bag is large, easily folds, and is easily my FAVORITE grocery bag. I always have at least one of these bags in my car at all times. They’re so versatile and I use it a ton. California recently passed a law against free plastic grocery bags, and ever since then my family members love to steal this tote whenever they go grocery shopping. I recently got this towel, which I adore since I live by the beach. The bright blue is pretty and it’s a really soft towel. If you get the towel, I’d recommend washing it in cold water by itself first, the dye can bleed on the first wash. Otherwise, it’s amazing and gets a lot of use. So this item isn’t on the official WordPress store, but as a woman who works with WordPress I can’t get enough of this t-shirt featuring Rosie the Wapuu! You can find all the Women who WP items here. Personally, I went with the tri-blend scoop neck t-shirt. The material was so soft and the cut was flattering. The sizes do run a bit large, so I wouldn’t recommend going a size up like I did. So those are my favorite WordPress swag items. What about you? Do you have any favorites? Share them in the comments! The Jetpack portable charger has been a lifesaver here in Spain!